A gentle yet effective solution for unwanted facial and body hair. Tweezing, waxing, shaving, electrolysis... they all have drawbacks. At SkinHealth Centers, we have a great solution - hair removal using the most advanced laser technology.It's faster, more convenient, less painful, and more efficient than other professional methods available to remove hair. And it is suitable for many areas. See a range of BEFORE AND AFTER IMAGES. Laser hair removal works by using light energy to permanently disable the hair follicle. The laser light selectively targets hair follicles while leaving other tissue untouched. 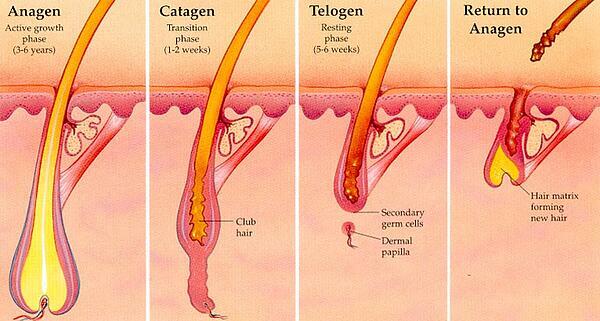 Since hair grows in cycles, several treatments are required. Atany one time, 50% to 80% of hair follicles are in the active growth phase and will be disabled by the laser. As the remaining dormant hairs begin to grow, those hairs should to be treated at a later date. The hair will become finer, thinner, and lighter after each treatment. For women, laser hair removal is rapidly becoming the treatment of choice for facial hair and bikini lines. How many times will I have to get treatments? The number of sessions will vary for each individual, but 3 to 5 treatments are usually required; some applications may require more. It depends on the area or areas you wish to have treated and your hair's density, thickness, and growth cycle. Your SkinHealth professional will discuss with you the treatment plan and formulate the best program to fit your needs. Who are the best candidates for laser hair removal? In general, the best results are achieved in individuals with dark hair (or dark hair roots) and a light skin color. This is because the laser light energy is absorbed by the pigment melanin in the skin, and is then transformed into heat to disable the hair follicle. In people with dark skin (more melanin in the skin), the melanin in the skin tends to compete with the hair for the light energy resulting in the potential for the laser damaging the skin instead of the intended hair follicle. Emerging laser technologies have made it possible for people with many skin and hair color combinations to enjoy the benefits of laser hair removal. These lasers have been designed to ignore the melanin in the skin and to safely treat patients of all skin types. Having said that, the most successful results are those patients with dark hair and light skin-- light skinned, dark haired patients will have a more significant result than patients with blond or red hair or patients with darker skin and will need fewer treatments for a more permanent hair reduction. During your initial free consultation with SkinHealth we will advise you if your skin and hair type would respond well to treatment. How is it different from electrolysis? It's gentler - no needles are used. And it's much faster. Electrolysis involves applying an electrical current through a needle into one hair follicle at a time. With laser hair removal, instead of treating one individual hair follicle at a time, within minutes, all the hairs in the laser's beam are treated. Are you bothered by excess hair, or is unwanted hair causing you unnecessary embarrassment? Find out more about the gentle and convenient SkinHealth Centers laser hair removal treatments. Our trained professionals will answer your questions and recommend a program to fit your needs, your timetable and your budget. It is best to consult with your specialist to see which laser system will work for you.